BBC NEWS | Americas | Guantanamo - black hole or vital tool? Guantanamo - black hole or vital tool? Five years after the first prisoners arrived at Guantanamo Bay, the detention camp is set for a new phase in the coming months with the start of military tribunals held under a law passed by the US Congress last September. However, only some 75 of the 395 prisoners there at the moment are likely to face these tribunals, at least in the initial stages. For the rest, there is the prospect of indefinite detention without trial. The camp - often simply called "Gitmo" and symbolised by the orange jumpsuits worn by prisoners in the earlier stages - remains intensely controversial. It is seen by the Bush administration as a vital tool in the "war on terror". It is one that enables suspects who are not US citizens to be interrogated and held, indefinitely if necessary, in a US-controlled territory but not subject to normal US court rules. Critics say it is a legal black hole in which suspects have been abused and face either military tribunals or open-ended imprisonment. It has been, and probably will be again, the subject of great legal arguments between the American presidency and judiciary. The US Supreme Court has made two key rulings that have brought the camp more under the supervision of the US congress and courts. The result of these arguments and interventions is the Military Commissions Act 2006. This satisfies the administration by approving tribunals where evidence can be brought, and detention without trial where it cannot. Military officers will conduct these tribunals. The law forbids "cruel" or inhumane treatment, but allows for coercive interrogation, which is regarded as important in gaining intelligence. It also narrows the application of the Geneva Conventions. Even close allies of the United States including Britain have called for the camp to be closed. President Bush himself said he would like to see the end of it. But it remains in being and there is no end in sight. The next move is for the tribunals or commissions to begin, probably in March or April. Among those to be put in front of tribunals is Khalid Sheikh Mohammed, described by Mr Bush as "the man believed to be the mastermind of the 9/11 attacks". The president also praised the Commissions Act for allowing the CIA to carry out so-called special interrogations, which are believed to include the practice of waterboarding, in which water is poured onto a prisoners face, inducing a feeling of drowning and panic. "This programme has been one of the most successful intelligence efforts in American history ... with this bill, America reaffirms our determination to win the War on Terror," Mr Bush said. 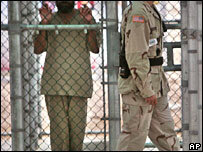 Amnesty International said on this fifth anniversary: "Guantanamo Bay is a symbol of injustice and abuse. It must be closed down." And Human Rights Watch executive director Kenneth Roth said: "Detaining hundreds of men without charge at Guantanamo has been a legal and political debacle of historic proportions. It's time to close Guantanamo. 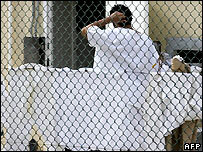 The Bush administration should either charge or release the detainees trapped in a nightmarish limbo." In all some 775 prisoners have been at the camp since 11 January 2002. Just under half, 379, have been released. Fourteen detainees are high-profile prisoners, who had been held at secret CIA prisons elsewhere and who were sent to Guantanamo Bay last September. It is thought that the tribunals will start with some of them, led perhaps by Khaled Sheikh Mohammed. But what of those, probably the majority, who will not face a tribunal? They are subject to an annual Administrative Review Board (ARB) "to determine whether you still pose a threat to the United States or its allies", as a document given to the prisoners states. The transcripts of the ARB hearings are published by the US Defense Department. There are allegations against the suspects but the evidence is in outline only and some of it is given to the board in secret. The source cannot be confronted. A look at the case of Sami al-Hajj (case 345), illustrates the "limbo" in which these cases can lie. Sami al-Hajj was a cameraman for the Arabic station Al-Jazeera when he was arrested by the Pakistan police while trying to enter Afghanistan in December 2001. He has said he was beaten up while being accused of being an al-Qaeda operative. He was later transferred to Guantanamo Bay. His 2006 ARB lasted for 40 minutes. A summarised version of the case against him was read out before the board went into secret session to hear other claims against him. The case was that he had been a courier for an Islamic charity called al-Haramayn which the US government has designated as one that "has provided support for terrorist organisations." He is also accused of working with or for individuals who were al-Qaeda figures. Sami al-Hajj told the board that he had "never been a member of a terrorist group" and that a mistake had been made. He condemned the "tragic attack on the World Trade Center in New York." His lawyer Clive Stafford Smith says that he did take money to Azerbaijan for al-Haramayn but that it was for charitable purposes. His wife is Azeri. "I do not think Sami will face a tribunal," said Stafford Smith. "They have really shown little interest in him and this is an obvious and shocking attempt to tread on the media. I think they will release him." As for the wider issue of Guantanamo Bay, he says that a challenge to the Military Commissions Act is already before the US courts. 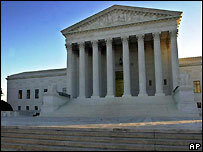 "I expect that it will reach the Supreme Court in about a year," he said.